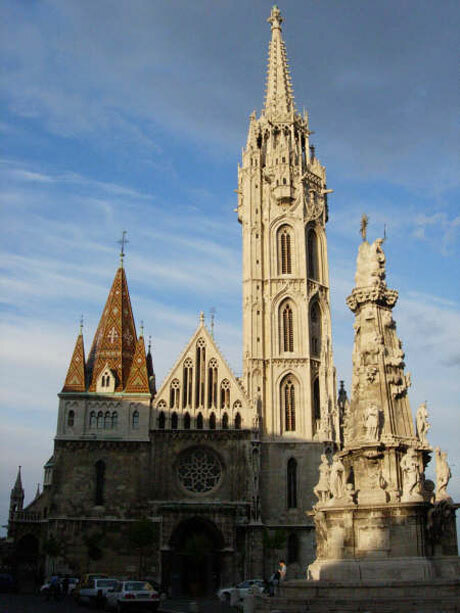 The Church of Mathias is the most famous catholic place of worship in Budapest, being highly rated and recommended as tourist site by virtually all visitors who have seen it. It is, at the same time, one of the oldest churches in Budapest, bearing the name of Mathias Corvinus, one of the greatest kings of Hungary. Despite its popular name, the church is dedicated to Virgin Mary, its official denomination being the Church of Our Lady. The church was built somewhere during the 14th century, though the construction works are said to have been completed no sooner than the 15th century. It served as the place where Hungarian kings used to be crowned, but during the Turkish occupation, it was turned in a mosque, and part of the catholic decorations, furniture and symbols were removed. In time, the church underwent repeated restorations, and the nowadays edifice is the result of the major renovation works carried out in the late 19th century. All these episodes have turned the original Gothic structure into one of the most striking Baroque buildings one can admire in Budapest. The chief highlights of the church refer to the impeccable stained glass windows and frescoes owed to figures like Karoly Lotz, Mihaly Zichy and Bertalan Szekely. Other attractions refer to the impressive collections on display which consist of ecclesiastical items (church clothing, coronation relics, the reliquary, the lapidarium). The treasury of the church is also worth visiting, since it shelters highly prized goldsmith works.